A New Drinking Water Paradigm for Public Health Protection. For well over a century the United States has used a multiple (four) barrier approach to protect public health from waterborne diseases. The first barrier included watershed and/or wellhead protection. However, in the past three decades, watershed and wellhead protection has been eroded in many areas due to growing population densities and the public’s desire for waterfront property and recreational use of drinking water reservoirs. The economic value of waterfront real estate has led many public and private drinking water utilities to sell large parts of their protected watersheds for housing developments. Similarly, mandatory set back distances for certain types of developments from wellhead protection areas have been relaxed in many parts of the U.S. The second barrier has always been appropriate treatment to take care of tastes, odor and color of the water as well as remove items that might interfere with disinfection such as particles or chlorine demanding substances. These treatment technologies have received increased optimization in the past thirty years but many treatment plants continue to face challenges from rapid changes in raw water quality as well as declining budgets for needed repairs and upgrades. The third barrier has long been primary disinfection using chlorine. However, since 1972 the use of chlorine has raised concerns due to the production of disinfection by-products (DBPs). These by-products including the trihalomethanes, the haloacetic acids and several others have long been a concern due to their potential carcinogenicity. More recently, concerns over the role of DBPs, in particular bromodichloromethane, in reproductive health effects including miscarriages have sparked strong public reaction and significant lawsuits. In contrast, the emergence of pathogenic Giardia lamblia cysts as a waterborne disease causing agent required higher chlorine doses, and hence more potential for DBPs, for effective disinfection. Further, since 1993. Milwaukee outbreak Cryptosporidium parvum oocysts have been the leading pathogen of concern in U.S. drinking water and chlorine is ineffective for disinfection of oocysts. In response to these changes, many utilities switched to ozone as their primary disinfectant. Ozone has been a successful option for many water systems and can be provide other benefits including taste and odor control and improved particle removal in filtration. However, ozone as with all disinfectants has negative aspects as well including production of the DBP bromate which can result in significant health effects. In addition, ozone is a more costly and complex disinfection system than utilities were accustomed to with chlorination. More recently, it has been shown that ozone doses required for inactivation of Cryptosporidium oocysts in colder waters (e.g., 1 0C) are much higher, maybe by as much as a factor of 2.0, than was first thought. If this temperature effect is the result of mass transfer phenomena then similar results may also be found for other chemical disinfectants or for the disinfection requirements of Giardia cysts. Concerns with chlorine and ozone coupled with the emergence of Ultraviolet disinfection for drinking water in 1998 have led many utilities to examine using Ultraviolet light as their primary disinfectant. 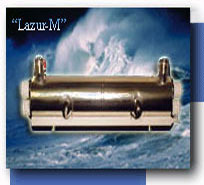 Ultraviolet has many advantages including lower costs and operational simplicity relative to ozone. Ultraviolet light is highly effective for Giardia and Cryptosporidium and Ultraviolet light at typical doses used for disinfection (40 to 70 mJ/cm2) does not contribute to the regulated disinfection by-product concerns. However, Ultraviolet disinfection is also not a panacea since waterborne pathogens such as Adenovirus are rather resistant to Ultraviolet light. In addition, implementation of Ultraviolet disinfection of drinking water on a large scale is a new experience for the U.S. Therefore, effective approaches for the selection, design, operation and monitoring of Ultraviolet disinfection systems must be proven. The fourth barrier has always been a secondary disinfectant, typically chlorine, to maintain a distribution system disinfectant residual. However, many systems have converted from free chlorine residual to a combined chlorine or monochloramine residual since it helps control DBP formation and persists longer in the distribution system. The use of chloramination for secondary disinfection is well proven but does require more careful control and in some systems steps are needed to prevent nitrification. In addition to the changing paradigms in U.S. public health protection, the drinking water regulations are also changing to address these emerging concerns. The United States Environmental Protection Agency (USEPA) is currently in the process of developing the Long Term 2 Enhanced Surface Water Treatment Rule (LT2ESWTR) and the Stage 2 Disinfectants and Disinfection Byproducts Rule (DBPR). These rules, to be finalized in 2004 and implemented over the next five years will encourage drinking water utilities to find a balance between the risks of pathogenic microorganisms and disinfection byproducts. The LT2ESWTR details drinking water regulations for public water systems using surface waters or groundwater under the influence of surface water as sources. The purpose of these rules is to provide the public adequate protection against microbial pathogens. The rules will focus on waterborne pathogens including Giardia, Cryptosporidium and human enteric viruses. The DBPR is intended to aid in the reduction of disinfection byproducts formed during chemical disinfection with chlorine. These rules will further limit the allowable levels of trihalomethanes (THM’s) and haloacetic acids (HAA’s) to 80 ug/L and 60 ug/L, respectively and require the monitoring of distribution system water quality for DBPs based on locational running annual averages (LRAA) to insure a more uniform decrease in DBPS throughout a communities water system (www.epa.gov, 2003). With so many new challenges to the multiple barrier approach to drinking water treatment and with the realization that there must be a balance between microbial health effects and chemical or DBP health effects it is clear that no single disinfectant can meet most drinking water system’s needs. Therefore, it is time for a new paradigm to protect public health from waterborne disease - the use of multiple disinfectant barriers within the historical multiple barrier approach. This paper will document the implementation of multiple disinfectants at several systems in the U.S. and the resultant public health and economic significance of those changes. Case studies are based on numerous lessons learned from recent experiences in the U.S. but no single case study is directly related to an actual U.S. drinking water system in order to protect the privacy and the legal rights and responsibilities of U.S. public drinking water utilities. All cases will be examined from three standpoints: a) compliance with Giardia, Cryptosporidium and virus regulations; b) compliance with DBP regulations; and c) costs. Case A involves a 15 MGD (2,366 m3/hr) conventional treatment facility that had used chlorine to obtain 1-log C*T credit for Giardia; 4-log C*T credit for viruses and maintain a distribution system residual of 0.2 mg/L at the farthest customer tap. The facility is being upgraded to conventional treatment with intermediate ozone followed by biological filtration followed by Ultraviolet disinfection and secondary disinfection with chloramines. As shown in Table 1, the upgrade adds a disinfection barrier for Cryptosporidium and dramatically reduces DBPs. DBP values for the system after the change are based on bench scale data from simulated distribution system DBP formation experiments. The upgrade is also anticipated to reduce customer complaints from season taste and odor problems experienced by this water system due to algae. Cost estimates for the upgrade are shown in Table 2 and are calculated for a number of disinfection scenarios (load sharing between ozone and Ultraviolet) that were considered. Option 5 was ultimately selected since the optimum use ozone was determined to be for taste and odor control, for viral disinfection credit and to provide some backup for Giardia disinfection to the Ultraviolet system. Due to uncertainties with ozone C*T requirements for Cryptosporidium disinfection credit in cold waters it was assumed that the ozone would have no credit. However, the ozone system will provide some disinfection back-up to the Ultraviolet system for Cryptosporidium during most of the year when operating temperatures are well above 5 0C. The overall capital cost estimate for the multiple disinfectant barrier upgrade is $8.3 million with an annual operation and maintenance (O&M) cost estimate of $118,750. Clearly, the project benefits far outweigh the costs of the upgrade. Case B involves a 300 MGD (47,320 m3/hr) unfiltered drinking water supply that had used watershed protection practices and chlorine to obtain 3-log C*T credit for Giardia; 4-log C*T credit for viruses and maintain a distribution system residual of 0.2 mg/L at the farthest customer tap. The facility is being upgraded to additional watershed protection practices ozone followed by Ultraviolet disinfection and secondary disinfection will remain chlorination. As shown in Table 3, the upgrade adds a significant double disinfection barrier for Giardia and for Cryptosporidium and reduces DBPs but not as much as in Case A since chlorine remains the secondary disinfectant of choice in this system. DBP values for the system after the change are based on bench scale data from simulated distribution system DBP formation experiments. Cost estimates for the Case B upgrade are shown in Table 4 and are calculated for a number of disinfection scenarios (load sharing between ozone and Ultraviolet) that were considered. Option 4 was ultimately selected since the optimum use ozone was determined to be for taste and odor control, for viral disinfection credit and to provide some backup for Giardia and Cryptosporidium disinfection credit in cold waters it was assumed that the ozone would have no credit. The overall capital cost estimate for the multiple disinfectant barrier upgrade is $154.5 million with an annual operation and maintenance (O&M) cost estimate of $2,400,000. The plant design flow is large and relatively speaking the project benefits far outweigh the costs of the upgrade. The Case B studies also examined the effects of ozone on the design of the Ultraviolet disinfection system. Ozone prior to Ultraviolet disinfection can significantly improve the Ultraviolet transmittance (UVT) of the water and UVT is a critical parameter for determining Ultraviolet disinfection system design and operating costs. 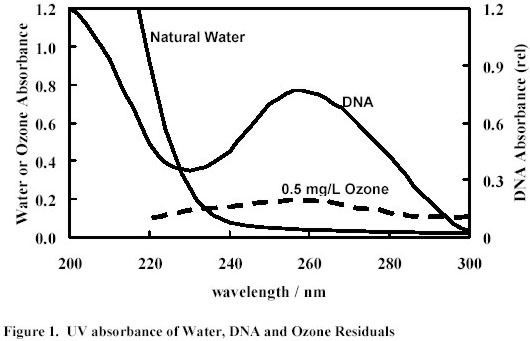 As shown in Figure 1, the Ultraviolet absorbance of a water sample can be affected by the natural water components and the presence of an ozone residual. Ultraviolet absorbance of the water in the same range where DNA absorbs Ultraviolet light can be considered analogous to a chlorine or ozone demand of the water in terms of its ability to interfere with Ultraviolet disinfection processes. 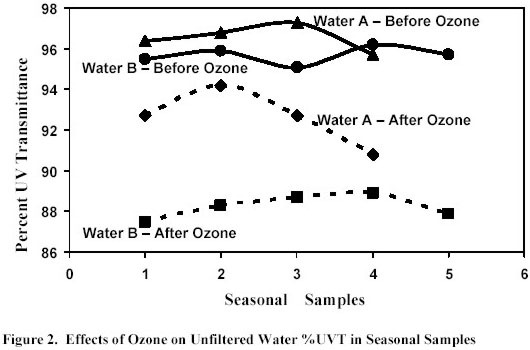 However, as shown in Figure 2 when natural water supplies are ozonated and there is no ozone residual remaining then the overall Ultraviolet transmittance of the water is increased by as much as 8% in the germicidal range and this will make Ultraviolet disinfection more cost effective to implement. The benefits of ozonation on Ultraviolet disinfection design are site specific and must be evaluated on a case by case basis due to difference is water quality, differences is local disinfection design objectives and differences in power costs. In most cases, the economic benefits of ozonation on Ultraviolet disinfection design would not justify the capital and operating costs of implementing ozonation. However, for many systems that either have ozone in place or that will install ozonation for multiple benefits such as taste and odor control then the benefits of ozone prior to Ultraviolet disinfection should be considered. Often it is prudent to design Ultraviolet disinfection systems for a conservative Ultraviolet transmittance assuming that ozone will not be used but then to operate the Ultraviolet disinfection systems at a reduced power level if ozonation is applied and the UVT has improved. 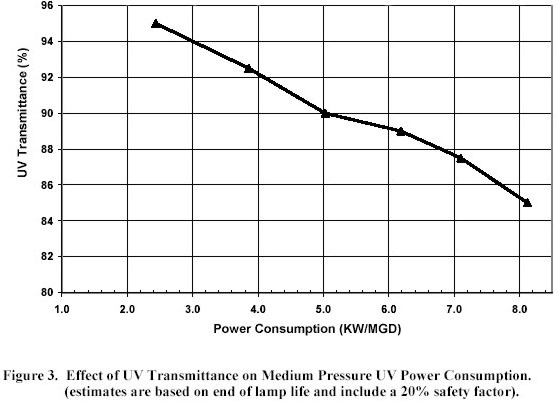 As shown in Figure 3, increased UVT can significantly reduce the power requirements for a medium pressure Ultraviolet disinfection system delivering a validated Ultraviolet dose of 40 mJ/cm2 at the end of lamp life. Table 5 shows the cost savings for a variety of system specific conditions that have been studied by the authors in recent years. These data suggest that savings are significant especially if the flows are large and the UVT prior to ozonation is relatively low. However, they also show that the savings are site condition specific and if UVT of the water is high and/or the regional power costs are low then this potential benefit of ozonation on reducing Ultraviolet power costs is negligible. Case C involves a 50 MGD (7,887 m3/hr) conventional treatment facility that had used chlorine to obtain 2-log C*T credit for Giardia; 4-log C*T credit for viruses and maintain a distribution system residual of 0.2 mg/L at the farthest customer tap. The facility is being upgraded to conventional treatment with followed by Ultraviolet disinfection to achieve 3-log credit for Giardia and Cryptosporidium and secondary disinfection with chlorine to achieve viral C*T and then conversion to chloramines for distribution system protection. As shown in Table 6, the upgrade adds a disinfection barrier for Cryptosporidium and dramatically reduces DBPs. DBP values for the system after the change are based on bench scale data from simulated distribution system DBP formation experiments. Cost estimates for the Case C upgrade are shown in Table 7 and are calculated for a number of disinfection scenarios (load sharing between ozone and Ultraviolet) that were considered. Option 6 was ultimately selected since ozone was not considered necessary nor desirable for this facility due to costs and complexities of operation and conversion to chloramines to reduce DBPs was highly desirable. The overall capital cost estimate for the multiple disinfectant barrier upgrade is $7.8 million with an annual operation and maintenance (O&M) cost estimate of $625,000. Clearly, the project benefits far outweigh the costs of the upgrade for this 50 MGD (7,887 m3/hr) facility. This paper has identified the changing political, economic and technical factors that influence multiple barrier approach to waterborne disease protection that has been used in the U.S. for the past century. A case is made here for a new paradigm which employs the use of multiple disinfectant barriers within the traditional multiple barrier approach. Using case studies the paper has identified the health benefits of switching to a multiple disinfectant barrier approach as well as some of the cost factors and comparisons that are needed. The potential benefits of using ozone and Ultraviolet disinfection are also presented and are shown to be site specific. Clearly a drinking water utility must carefully evaluate the pros and cons of the wide variety of multiple disinfectant barrier options that are presently available to them. The final decision needs to be site specific and should consider as a minimum: the desired pathogen inactivation; DBP formation and control; and the capital and O&M costs of each option. This paper would not have been possible without the support both financial and technical as well as the knowledge provided to our research group over the past 12 years by numerous sponsors including AwwaRF, USEPA, EPRI, WERF, NHDES, NOAA, CH2M Hill, Black & Veatch, Dufresne and Henry, FS&T, Wright-Pierce and Carollo Engineers. In addition, we are indebted to the dozens of drinking water utilities and their personnel who have taught us so many practical lessons about disinfection processes and often let us use their water treatment facilities as our laboratory.